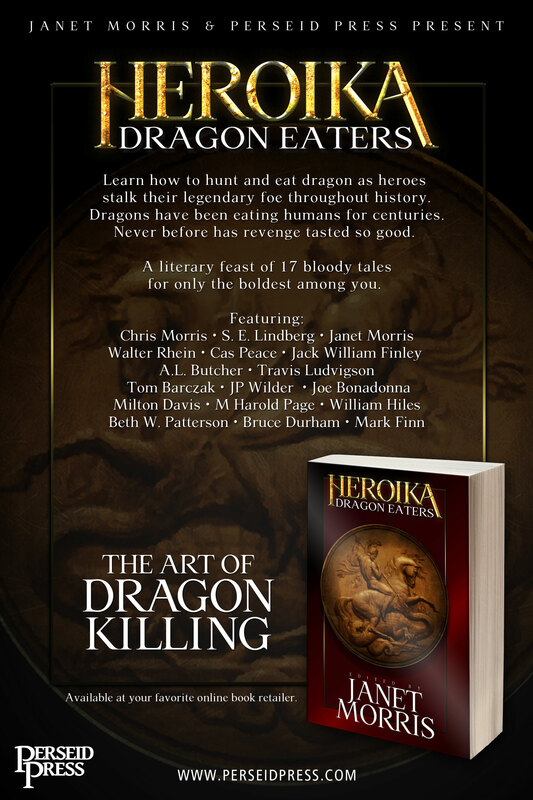 Heroika 1: Dragon Eaters is an anthology of well-crafted work with a wide range of entertaining perspectives. Spanning across cultures, centuries, and even the dimensions of time and space, each contribution has its own distinct charm. In essence, this book is a colorful bouquet of bold stories about one of the darkest primal forces in mythological lore. Published by Perseid Press and edited by Janet Morris, this collection is due to be released on May 25, 2015. There are seventeen tales in all. Though breaking each one down with literary criticism would take multiple reviews to cover thoroughly, it is advised to just pick up a copy and dive right in because odds are pretty good you’ll find plenty to enjoy. The collection begins with The First Dragon Eater by Janet Morris and Chris Morris, which reads like a classic saga of the Gods form Greek mythology. Having lost his heart and eyes to the dragon Illuyankas long ago, the Storm God Tarhunt capitalizes on the vulnerability and hubris of his own children to get his organs back, and in turn he sets out for revenge on the winged beast who almost killed him. In the Legacy of the Great Dragon by S.E. Lindberg, readers will discover another use for the dragons in getting one’s sight back, but here we cross the fine line between man and god, and see how the twisted significance of the word “legacy” can define both. Writers Janet Morris and Chris Morris join forces again for the third story Bring Your Rage. But this tome is less about the gods as in their previous entry and more about how raw barbarism can be played out in a poetic quest to slay a dragon and define the true meaning of a hero. Aquila of Oyos by Walter Rhein is an emotional twist of honor and subservience between two dragons facing each other in a man’s world. Just as complex but from a different perspective, The Wyght Wyrm by Cas Peace is an intricate story of dragon magic and the cruelty of man when it is harnessed for war. Though the ending of the next story was surprising yet thought provoking, The Old Man on a Mountain by Jack William Finley is a fulfilling adventure of one man’s quest for revenge and a dragon’s acceptance of fate. Of Blood and Scales by A.L Butcher is a story of lies and deceit behind a girl’s long journey to the throne while Night Stalkers by Travis Ludvigson is a tale of a man’s loyal dedication to serve his Lord, the ruler Charlemagne. Forged by Tom Barczak is a fairytale adventure with good versus evil, eventually allowing readers to discover the hidden magic of dragons that lies in the soul of a young girl and how “love” works its magic in unexpected ways. And The Rhyme of the Dragon Queen by JP Wilder is another enchanted story following a rhythmic song with prophetic implications and the colorful cast of characters who try to avoid its dark predictions. Joe Bonadonna’s ability to draw on all five senses of the observant reader gives the story The Dragon’s Horde a dimension often left to the device of the characters. What this does is let the story of battling mythological creatures unfold with just enough realism to allow the tightly developed characters to act naturally on the stage of such an epic adventure. Wawindaji Joka (The Dragon Hunters) by Milton Davis is a unique story where the dragon hunters might be as precarious as the dragons they hunt. Just as innovative, M. Harold Page brings a rare Steampunk version of dragon lore in Against the Sky Tomb of the Earth Kings where the battle is taken high into the clouds. Red Rain by William Hiles gives readers a fast paced Civil War perspective in the battling dragons. If the War-Between-the-States can pit brother against brother, what will happen when the mythical creatures are thrown into the mix? In La Bétaille by Beth W. Patterson, the dragon fight is taken to Cajun country in the south. Yet in Bruce Durham’s tense story Arctic Rage, readers find themselves in a frosty post-nuclear apocalypse Inuit setting where the hunter and the hunted play dual roles. The collection is finally wrapped up with a suspenseful time traveling twist of fate. In what first looks to be the near future and some hard charging marines, we are surprisingly taking way back in time where the modern fight emerges as a bit prehistoric in Sic Semper Draconis by Mark Finn. As you can see, there is quite a lot packed into Heroika 1: Dragon Eaters. Some elements of these stories stem from traditional folklore while others bring a fresh new light to the genre. Most of the heroes are as complex as the beasts they face, and in some cases, they are one in the same. Be it a novice just looking to learn more about dragons or a veteran hoping to discover some bold new truths, this collection will appeal to any fan of the legendary magical creatures. This entry was posted in Akkadian mythology, Books, dragons, Druid, fantasy, folklore, Greek mythology, heroic fantasy, heroic model, historical military fantasy, Hittite mythology, Homeric fantasy, HUrrian mythology, kinghts, Legends, literature, metaphysics, military fantasy, myth, mythic fiction, mythological, Norse Mythology, witches and tagged ancient cavalry, ancient fantasy, ancient Greece, ancient warfare, Chris Morris, dark fantasy, epic fantasy, equestrian fiction, fantasy, folklore, heroes, heroic fantasy, historical.